Lionel Edward Baldock was born on 24 March 1890 at Booleroo Centre, South Australia. His parents were George Henry ‘Harry’ Bee Baldock born 14 March 1851 and Mary Baldock nee Melvin born 22 January 1878. Lionel was one of 7 children born to George and Mary. Lionel’s siblings were Frederick Baldock (1878 – 1938), Charles Henry Baldock (1880 – 1958), Albert Baldock (1882 – 1965), Walter Baldock ((1884 – 1942), Alice Mary Baldock (1887 - 1946) and Ada Grace Baldock (1893 - 1971). Historical records show that Lionel’s siblings spent most of their lives in the mid-north of South Australia in the Wilmington, Melrose, Port Pirie and Whyalla areas. Lionel’s occupation at the time of enlistment was recorded as a Mason’s labourer. My father, George Thomas Baldock Pedersen (1910 – 1967) and Lionel Edward Baldock were second cousins. Lionel enlisted on 30 November 1914 at Oaklands, South Australia. His age at enlistment was 24 years 8 months. His religion was recorded as Church of England and he was certified medically fit at Port Pirie on 1 December 1914. 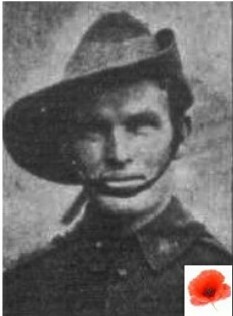 Lionel was described at the time of enlistment as 5’9” tall (174 cm), 10 stone (79 kg), with a tan complexion, brown hair and blue eyes. The duration of service he signed up for was for the duration of the war plus 4 months. On 4 December 1914, Lionel was assigned to the 12th Battalion, 3rd Reinforcements Australian Imperial Forces. His date of embarkation from Adelaide was recorded as 15 February 1915 aboard HMAT Itonus A50. No family history is available as to why Lionel decided to enlist. None of his siblings served during the Great War and archive records show he was corresponding with his mother following his enlistment. A family tree prepared by my half-brother during the 1990’s however failed to identify that Lionel had served his country during the Great War. My father passed away when I was 8 years of age and I have never met my extended family from his first marriage. To me, there appears to have been a fracture in the family during this period for it to be unrecorded in the family history. My father served in the Royal Australian Navy during World War 2. I have studio photographs of him in uniform and the family resemblance between my father and Lionel is unmistakeable. “The Battle of Menin Road was the third of seven major British offensives during the 3rd Battle of Ypres”. “On 20 September 1917, the Australian 1st and 2nd Divisions of 1st ANZAC Corps moved forward on a 3 kilometre front with Menin Road on their right capturing the western half of Polygon Wood. The Infantry had to overcome formidable entrenched German positions including concrete pillbox strongpoints. The two Australian Divisions sustained 5013 casualties”. I have conducted research on battles that took place on the Western Front in Belgium and France on or about 19 – 20 September 1917 when Lionel was killed in action. The above battle involved the 12th Battalion and I believe this could be where Lionel met his fate however this is inconclusive.